What apps are incompatible with 256MB RAM Windows Phone devices? The announcement of the Nokia Lumia 610 and ZTE Orbit bought a new set of lower specifications to Windows Phone. While almost all built in functionality is retained, one of the consequences of the reduced RAM requirements (from 512MB to 256MB) is that some apps cannot be installed, due to their higher memory usage footprint. In this feature we look at detailed statistics, culled from the AAWP App Tracking service, around the compatibility of apps and games from the Marketplace with these 256MB RAM devices. Currently just 1.6% of apps and games are incompatible and this number is expected to fall over time as developers release updates. We're also providing a complete list of incompatible apps and games in our free downloadable PDF report. Apps and games running on Windows Phone 7.5 devices with 256MB of RAM, such as the Nokia Lumia 610 and ZTE Orbit, should not exceed 90MB of RAM usage and should correctly disable background agents. Because of these requirements, some apps will not run on these devices. This application is not available for your device. Please press here for more details. Application not available. This application requires a phone with more RAM than the <Device Name>. This may frustrate some users, but it's arguably a better experience than searching for an app you know exists, but being unable to find it. It's also a lot better than being able to download the app and finding it doesn't work or causes your phone to become unstable. Out of 86,292 apps currently live (active) content items in the Windows Phone Marketplace 1,387 (1.6%) are not compatible with 256MB devices. This is significantly less than Microsoft's initial estimate of 5% that was mentioned at Mobile World Congress. However, if we look at the 10,000 most popular apps (UK downloads), then 464 (4.6%) apps are incompatible with 256MB devices. In other words, for the top 10,000 apps, the proportion of incompatible apps is greater than for the overall marketplace. Taking just the top 1,000 apps gives a slightly higher proportion, with 64 incompatble apps and games (6.4%) - of these, just under 50% of the total are games. This should come as no surprise, given that games are generally more resource hungry than apps. 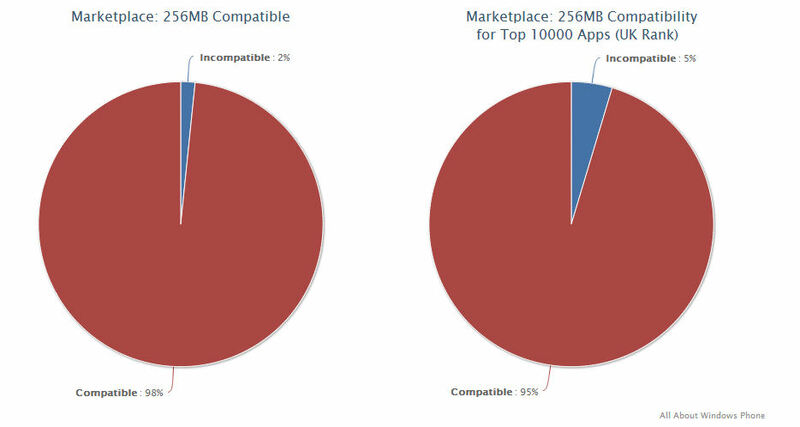 Out of 8,032 games available in the Windows Phone Marketplace, 310 (3.8%) are incompatible with 256MB devices. Games make up 22% of the total number incompatible apps, but only 12% of the content available in the Marketplace. 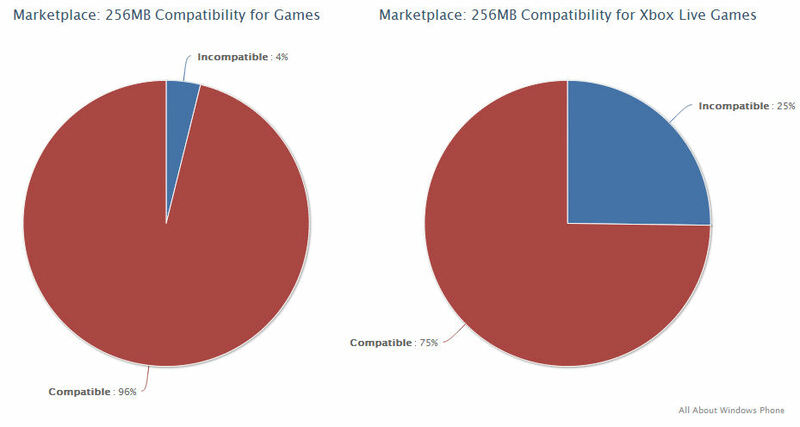 Games are more than twice as likely to be incompatible with 256MB devices than apps. In the case of Xbox Live games, 30 titles, out of a total of 119, are incompatible with 256MB devices. This means that 25.2% of Xbox Live titles will not run on devices like the Nokia Lumia 610. The Xbox Live titles that are not compatible with 256MB devices are: Angry Birds, Assassin's Creed, Beards & Beaks, Bejeweled LIVE, Brain Challenge HD, Bug Village, COLLAPSE, Cro-Mag Rally, Deer Hunter 3D, DODONPACHI MAXIMUM, Doodle God, Fable: Coin Golf, Fragger, Glyder: Adventure Worlds, Halo Waypoint,Hydro Thunder GO, IonBallEX, Lets Golf 2, MiniSquadron, MONOPOLY, NFS: Hot Pursuit, Orbital, PES 2012, Plants vs. Zombies, Rocket Riot, Sid Meier’s Pirates!,Spider Jack, Tentacles, The Harvest and The Sims 3. While some of the incompatible apps are high profile (Skype, Angry Birds, Google, Photobucket, Tango), the overall percentage of incompatible apps is relatively small. The compatibility issue is more apparent with games, especially the high profile Xbox Live titles. In both cases, the proportion of incompatible apps should fall over time. It's notable that just 250 incompatible content items have been published since the release of the Windows Phone 7.1.1 SDK - just 0.8% of the total number of apps published in the same period. This suggests developers have taken on board Microsoft's recommendation to test and allow for usage under the 256MB RAM case when creating new apps. Existing apps are also being updated for 256MB device compatibility. We noted several updates when compiling these statistics and others are in progress. For example, Rovio is said to be working on an update for its best selling game Angry Birds. In most cases, it will be possible to optimise an app to run on 256MB devices (e.g. by reducing or optimising graphic and audio resources), although there will be some apps that cannot be updated or need an extensive rewrite. Even so consumers should be aware of the limitations of a 256MB device when making a purchasing decision, especially if they enjoy playing games on their phone. But it's also fair to say, given the lower specifications / costs of such devices, that such trade offs are inevitable. The issue of specification constrained apps is not unique to Windows Phone; you'll find a similar story for lower cost Android and Blackberry devices. Microsoft has arguably done a better job of handling the issue than its rivals, with developer outreach programs, rigorous testing and a clear delineation of compatibility within the app store. In the concern around app compatibility on 256MB devices, it's important not to lose sight of the fact that their lower specifications (and associated lower price point) significantly widens the addressable market for Windows Phones devices. While power users may be horrified by the absence of a favoured app from a device like the Lumia 610, the people who are actually likely to buy it are far more likely to be happy that they're getting 95% of the Windows Phone experience for half the price. You can download our custom app report, which lists all apps and games that are not compatible with 256MB devices, here (PDF, 3.6MB). There are currently 1,397 apps listed in this report. 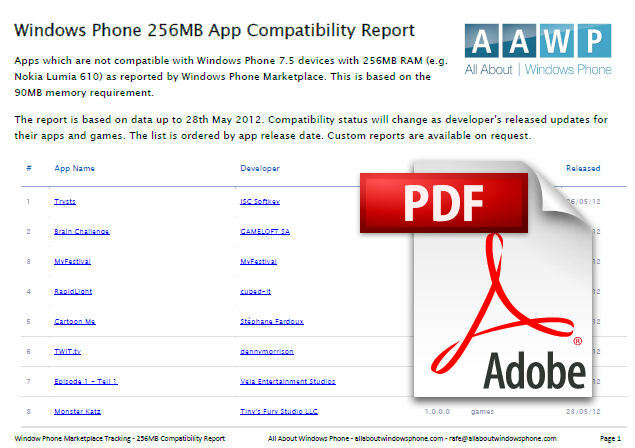 Some additional apps are also incompatible with 256MB devices, but these are not listed as they are no longer live on the Marketplace (withdrawn by publisher, or pulled by Microsoft), and therefore cannot be downloaded to a new device. This report is current as of May 28th 2012. As noted above, it is anticipated that some developers will release updates for their apps and games to make them compatible with 256MB devices - as such this list is subject to change. This is an example of the type of reports that can be created by the AAWP App Tracking service. We also use the service to generate our regular reports on Marketplace milestones. If you're interested in getting additional insight or more detailed data, please get in touch and ask about the AAWP App Tracking service. Filed: Home > Features > What apps are incompatible with 256MB RAM Windows Phone devices?